The British Approvals Service for Cables (BASEC) has hosted its first CPR for cables training course less than two weeks after the launch of the Construction Products Regulation (CPR) as applied to power, control and communication cables in accordance with EN 50575:2014. The course, held on 21 and 22 July, was held to provide vital information and insight to manufacturers and distributors about the complex requirements of the regulation and to support prompt, comprehensive and cost effective compliance. CPR introduces new testing and certification requirements and also new CE marking requirements, the latter of which will become a mandatory requirement from 1 December 2016. This is a significant new regulation and it is advised by BASEC that all manufacturers and distributors of cable that fall under the requirements of ‘general applications in construction works subject to reaction to fire requirements’ start preparing now. 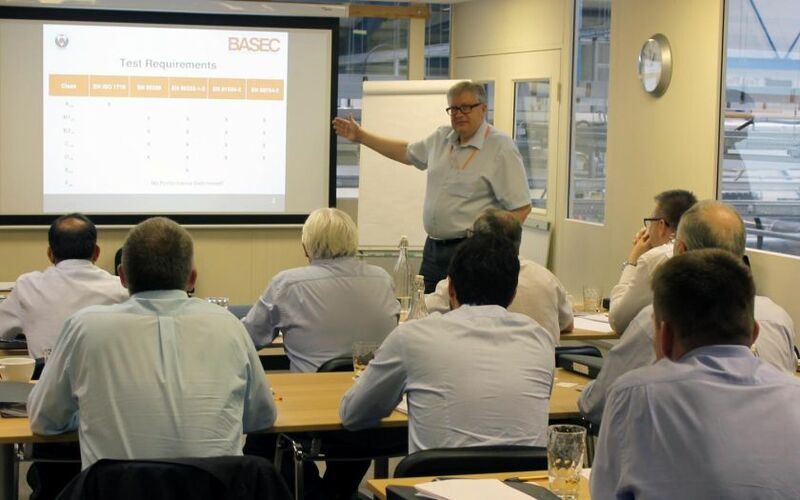 The first BASEC course was quickly taken up and included an in depth analysis of the requirements, worked examples and test protocols and a tour of BASEC’s laboratory to view its facilities and test equipment. over the coming months,” continued Jeremy. BASEC will continue to host CPR courses throughout the year. The future courses will also integrate important updates of standards for cables offering fire resistance and circuit integrity, which will be announced soon. role in the electrical industry is available at www.basec.org.uk, technical@basec.org.uk, or contact BASEC directly on +44 (0)1908 267300.